clients in the United States Federal Court. 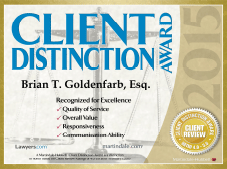 Distinguished Award and was recognized for excellence in his practice of law. Mr.
highest rating of an A+. with his clients, and any potential new clients. him at anytime at (732) 321-9100 or online.